Akkad (/ˈækæd/) or Agade (cuneiform: 𒌵𒆠 URIKI) was the name of a Mesopotamian city and its surrounding area. Akkad was the capital of the Akkadian Empire, which was the dominant political force in Mesopotamia during a period of about 150 years in the last third of the 3rd millennium BC. Its location is unknown, although there are a number of candidate sites, mostly situated east of the Tigris, roughly between the modern cities of Samarra and Baghdad. Before the decipherment of cuneiform in the 19th century, the city was known only from a single reference in Genesis 10:10 where it is written אַכַּד ( 'Akkad), rendered in the KJV as Accad. The name is given in a list of cities of Nimrod in Sumer (Shinar). Sallaberger and Westenholz (1999) cite the number of 160 known mentions of the city in the extant cuneiform corpus, in sources ranging in date from the Old Akkadian period itself down to the Neo-Babylonian period. The name is spelled logographically as URIKI, or phonetically as a-ga-dèKI, variously transcribed into English as Akkad, Akkade or Agade. The etymology of the name is unclear, but not of Akkadian (Semitic) origin. Various suggestions have proposed Sumerian, Hurrian or Lullubean etymologies. The non-Akkadian origin of the city's name suggests that the site may have already been occupied in pre-Sargonic times, as also suggested by the mentioning of the city in one pre-Sargonic year-name. The inscription on the Bassetki Statue records that the inhabitants of Akkad built a temple for Naram-Sin after he had crushed a revolt against his rule. The main goddess of Akkad was Ishtar-Astarte (Inanna), who was called ‘Aštar-annunîtum or "Warlike Ishtar". Her husband Ilaba was also revered in Akkad. Ishtar and Ilaba were later worshipped at Sippar in the Old Babylonian period, possibly because Akkad itself had been destroyed by that time. The city was certainly in ruins by the mid-first millennium BC. Many older proposals put Akkad on the Euphrates, but more recent discussions conclude that a location on the Tigris is more likely. The identification of Akkad with Sippar ša Annunîtum (modern Tell ed-Der), along a canal opposite Sippar ša Šamaš (Sippar, modern Tell Abu Habba) was rejected by Unger (1928) based on a Neo-Babylonian text (6th century BC) that lists Sippar ša Annunîtum and Akkad as separate places. Harvey Weiss (1975) proposed Ishan Mizyad, a large site 5 kilometres (3.1 mi) northwest from Kish. Excavations have shown that the remains at Ishan Mizyad date to the Ur III period and not to the Akkadian period. Discussion since the 1990s has focussed on sites along or east of the Tigris. 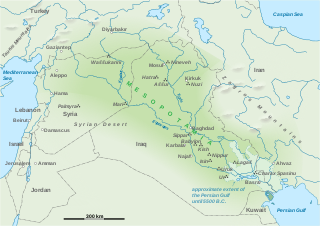 Wall-Romana (1990) suggested a location near the confluence of the Diyala River with the Tigris, and more specifically Tell Muhammad in the south-eastern suburbs of Baghdad as the likeliest candidate for Akkad, although admitting that no remains datable to the Akkadian period had been found at the site. Sallaberger and Westenholz (1999) suggested a location close to the confluence of the ʿAdhaim river east of Samarra (at or near Dhuluiya). Similarly, Reade (2002) suggested a site in this vicinity, by Qādisiyyah, based on a fragment of an Old Akkadian statue (now in the British Museum) found there. This had been suggested much earlier by Lane. Based on an Old Babylonian period itinerary from Mari, Syria, Akkad would be on the Tigris just downstream of the current city of Baghdad. Mari documents also indicate that Akkad is sited at a river crossing. ^ Foster (2013): "Akkad was originally the name of an area and city near the confluence of the Diyala and Tigris rivers in Mesopotamia (Adams 1965; Weiss 1997). The meaning of the word is unknown. 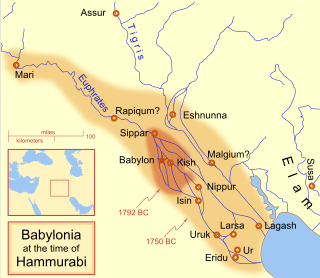 After it became the seat of the Sargonic Dynasty around 2300 bce, Akkad as a territory expanded to mean northern Babylonia, from north of Nippur to Sippar. The city of the same name is first attested in the late Early Dynastic period, became an imperial capital in the Sargonic period, and was still occupied in the second millennium. By the mid‐first millennium the city's cults had been transferred elsewhere and the former capital was a famous ruin. In modern scholarship, the city is often distinguished from the region by calling it Agade. Its location has not been identified." ^ a b "Akkade may thus be one of the many large tells on the confluence of the Adheim River with the Tigris" (Sallaberger, and Westenholz 1999, p. 32. The geography of Mesopotamia, encompassing its ethnology and history, centered on the two great rivers, the Tigris and Euphrates. While the southern is flat and marshy, the near approach of the two rivers to one another, at a spot where the undulating plateau of the north sinks suddenly into the Babylonian alluvium, tends to separate them still more completely. In the earliest recorded times, the northern portion was included in Mesopotamia; it was marked off as Assyria after the rise of the Assyrian monarchy. Apart from Assur, the original capital of Assyria, the chief cities of the country, Nineveh, Kalaḫ and Arbela, were all on the east bank of the Tigris. The reason was its abundant supply of water, whereas the great plain on the western side had to depend on streams flowing into the Euphrates. Opis was an ancient Babylonian city near the Tigris, not far from modern Baghdad. Akkadian and Greek texts indicate that it was located on the east side of the Tigris, near the Diyala River. 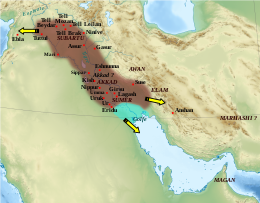 While the precise site of the city has been considered uncertain for a long time, recent geographical surveys of ancient Mesopotamia identify Opis with great probability as the mound called Tall al-Mujailāt, 20 miles (32 km) southeast in a straight line from central Baghdad and 47 miles (76 km) northeast in a straight line from ancient Babylon. 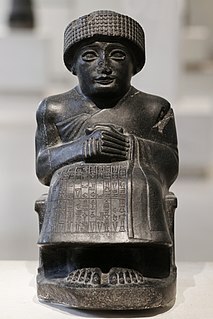 Rimush was the second king of the Akkadian Empire. He was the son of Sargon of Akkad and Queen Tashlultum. He was succeeded by his brother Manishtushu, and was an uncle of Naram-Sin of Akkad. Sippar-Amnanum was an ancient Near Eastern tell about 70 kilometers north of Babylon. Sumerian religion was the religion practiced and adhered to by the people of Sumer, the first literate civilization of ancient Mesopotamia. The Sumerians regarded their divinities as responsible for all matters pertaining to the natural and social orders. 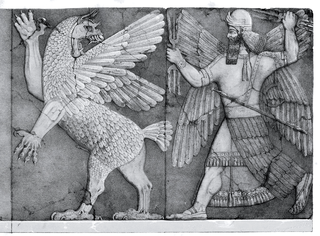 The Victory Stele of Naram-Sin is a stele that dates to approximately 2254-2218 BC, in the time of the Akkadian Empire, and is now in the Louvre in Paris. The relief measures six feet in height and was carved in pink limestone. It depicts the King Naram-Sin of Akkad leading the Akkadian army to victory over the Lullubi, a mountain people from the Zagros Mountains. It shows a narrative of the King crossing the steep slopes into enemy territory; on the left are the ordered imperial forces keeping in rank while marching over the disordered defenders that lay broken and defeated. Naram-Sin in shown as by far the most important figure; he is shown towering over his enemy and troops and all eyes gaze up toward him. The weak and chaotic opposing forces are shown being thrown from atop the mountainside, impaled by spears, fleeing and begging Naram-Sin for mercy as well as being trampled underfoot by Naram-Sin himself. This is supposed to convey their uncivilized and barbaric nature making the conquest justified.